The Monday’s episode put in prominence the clamour for the removal of the ‘Manusmriti’ along with the Manu statue. JAIPUR: Two women from Aurangabad city sprayed black paint on a Manu statue in the Rajasthan High Court’s premises on Monday, triggering uproar from a section of the society. Lawyers protested at the lack of security and ensured that the women were arrested for their actions. The two Dalit women were booked for harming the public property and hurting religious sentiments. 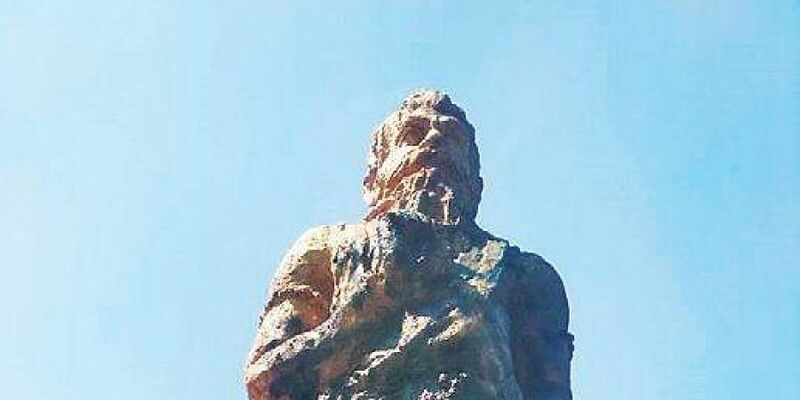 “Both the women, Sheelabai and Kanta Ramesh Ayare, have said that they oppose Manu’s philosophy and sprayed ink on the statue as a sign of protest,” said Station House Officer Madan Beniwal of the Ashok Nagar police station. The Monday’s episode put in prominence the clamour for the removal of the ‘Manusmriti’ along with the Manu statue. Dalits have been opposing the construction of the statue since its inception 28 years ago. At that time, the court had given the order to take the statue down, but VHP leader Acharya Dharmendra had got a stay on the order. Replace the statue with that of Ambedkar the architect of our Constitution. In the cow belt even high court judges could not shake off allegiances which are anti people. What is the relevance of Manu in a democratic republic ruled by a modern forward looking COnstitution.